This past week the tool SEO Analyzer was explored in class. So I decided to plug my url into the tool and to examine my results. 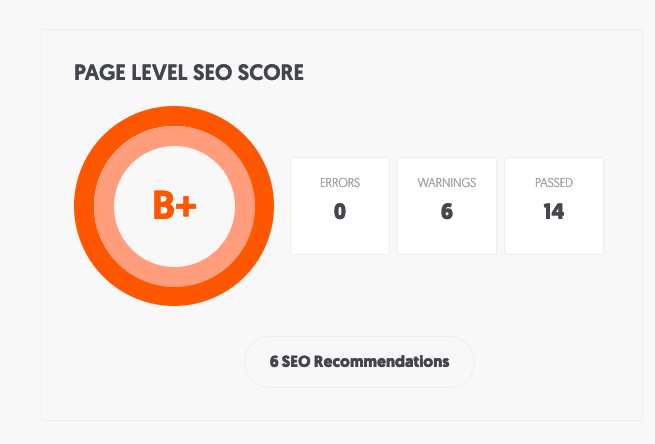 I am pretty happy with a B+ for my SEO as I have only begun to strive to consider how good my SEO as I develop and grow my site. I had no idea that my heading tags are actually too short, such as About Me, Subscribe, and Contact Me. I want to do further research around just how long these headings should be. If I do decide to change them, I will make them more conversational. Similar to changes I made in my actual posts where the subheadings are now in phrase form. iFrame content is the biteable video I created as a part of the assignment to explain my brand narrative without visuals. The format of the video does not lend itself nicely to my homepage, so I have debated removing it many times. This has convinced me to do so. My tagline “Avid NA Reader Turned Avid NA Reviewer” is also too short according to this SEO Analyzer. I was under the impression that taglines should be on the shorter side, but I will admit to never being happy with my tagline so I am looking at alternatives and are debating changing it. I am aware that many images on my blog are missing descriptive alt tags. I plan to do an overall site maintenance soon in which I add these descriptive alt tags and double check that none of my images are broken. Using SEO Analyzer was very helpful as it brought to my attention problems I had not even identified as problems yet.